In this guide, we will learn the working of Serialization in Java. To serialize an object means to convert its state to a byte stream so that the byte stream can be reverted back into a copy of the object. 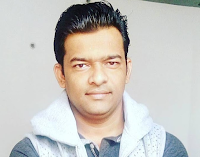 A Java object is serializable if its class or any of its superclasses implements either the java.io.Serializable interface or its subinterface. Deserialization is the process of converting the serialized form of an object back into a copy of the object. For example, the java.awt.Button class implements the Serializable interface so you can serialize a java.awt.Button object and store that serialized state in a file. Later, you can read back the serialized state and deserialize into a java.awt.Button object. It is mainly used in Hibernate, RMI, JPA, EJB and JMS technologies. Advantage: It is mainly used to travel object's state on the network (known as marshaling). Serializable is a marker interface (has no data member and method). It is used to "mark" java classes so that objects of these classes may get the certain capability. The String class and all the wrapper classes implement a java.io.Serializable interface by default. In the above example, the Employee class implements the Serializable interface. Now its objects can be converted into a stream. The ObjectOutputStream class is used to write primitive data types and Java objects to an OutputStream. Only objects that support the java.io.Serializable interface can be written to streams. In this Serialization example, we are going to serialize the object of Employee class. The writeObject() method of ObjectOutputStream class provides the functionality to serialize the object. We are saving the state of the object in the file named employees.txt. Let's create a class Employee which implements the Serializable interface. Now write the code to serialize the object. In the example, serializeProcessing() private methods perform serialization. 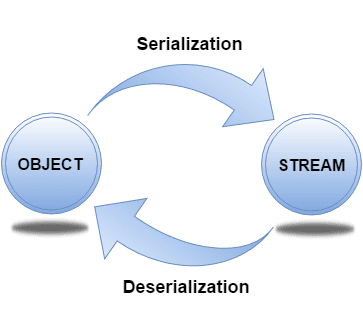 Deserialization is the process of reconstructing the object from the serialized state. It is the reverse operation of serialization. An ObjectInputStream deserializes objects and primitive data written using an ObjectOutputStream. In this deserialization example, deSerializeProcessing() does the deserialization process. Now you can serialize the Employee class object that extends the Person class which is Serializable. Parent class properties are inherited to subclasses so if the parent class is Serializable, subclass would also be. If a class has a reference to another class, all the references must be Serializable otherwise serialization process will not be performed. In such case, NotSerializableException is thrown at runtime. If you don't serialize the Address class then you can not serialize the instance of Employee class. In the above example, Address class is serialized so we can serialize the instance of Employee class. Important: All the objects within an object must be Serializable. If there is any static data member in a class, it will not be serialized because static is the part of class not object. **Rule:** In case of array or collection, all the objects of array or collection must be serializable. If any object is serializable, serialization will be failed. The Externalizable interface provides the facility of writing the state of an object into a byte stream in compress format. It is not a marker interface.